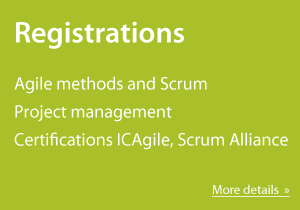 Full training and supervision on transition to Scrum process - courses, workshops, coaching, consultancy. Management team training, set up the right expectations from agile adoption process and Scrum implementation. Starting a pilot team by initial training and then continue with regular team, Scrum Master and Productowner coaching sessions on Sprint basis). After initial period, starting the next five teams (training, initial workshops and coaching). Additioanal workshops focused on Scrum Masters and Product Owners development.